Nuclear waste removed from Sequoyah Fuels site Cherokee Nation, GORE, Okla. 30 Nov 18— A semitrailer quietly left the former Sequoyah Fuels Corporation site near Gore this week, hauling away the last of 511 loads of nuclear waste that has plagued Sequoyah County and its citizens for decades. A community vote on the proposed nuclear waste dump on South Australia’s Eyre Peninsula has been delayed after an Aboriginal group won a court injunction. The Barngarla people, the traditional owners of much of the Eyre Peninsula, applied for an injunction to halt the vote in South Australia’s Supreme Court, arguing it contravened the Racial Discrimination Act 1975. Lawyers for the Aboriginal group argued the District Council of Kimba did not have the power to conduct the postal ballot, which was due to begin on Monday. The lawyer representing the Barngarla Determination Aboriginal Corporation, Daniel O’Gorman SC, told the court his clients had no issue with the vote going ahead, they just wanted to be included in it. “That’s all they want, they just want to be included, they don’t want to be treated any differently because their rights are Aboriginal rights,” he said. The court heard the majority of the 211 native title holders lived outside the boundary of the Kimba District Council and that excluding them from the vote had the effect “of nullifying or impairing their rights”. But Michael Burnett, representing the District Council of Kimba, told the court its power to conduct the postal vote came from the Local Government Act. He said the council wanted to conduct the vote in a fair manner and decided the fairest manner was to comply with “the statutory procedure that applies in the case of elections”. “It’s not a vote that has direct consequences … it’s part of a range of consultations that will be taken into account,” he said. Mr Burnett said there were direct consultations taking place with native title holders about the proposed sites, a claim which Mr O’Gorman rejected. “They’re getting two bites of the cherry and therein lies the exclusion, [the native title holders are] only getting one,” Mr O’Gorman said. Mr Burnett questioned why the Barngarla Determination Aboriginal Corporation had waited until August to seek an injunction when they had known about the vote since May. But Mr O’Gorman said the corporation had written to the District Council of Kimba on six occasions seeking to be included in the postal vote and council had only made its final decision on July 27. The vote of around 800 residents who live in Kimba will be delayed until after a full court hearing next Thursday. Navajo Nation urges expansion of radiation exposure law https://www.nhonews.com/news/2018/jul/17/navajo-nation-urges-expansion-radiation-exposure-l/ SHIPROCK, N.M. (AP) 17 July 18 — From the end of World War II to the mid-1980s, about 30 million ton of uranium ore were extracted from lands belonging to the nation’s largest American Indian reservation. Today, across the Navajo Nation, sit dozens of abandoned uranium mines and the high risk to residents of contamination exposure. FARMINGTON — Federal and tribal officials expressed support Wednesday for proposed amendments to the Radiation Exposure Compensation Act during a hearing in the U.S. Senate Judiciary Committee. The bipartisan legislation was introduced in January 2017 to expand compensation under the act to victims of radiation exposure, including those who worked in uranium mines after 1971 in northwest New Mexico and those exposed to radiation from testing sites in the West and the Pacific islands. Sen. Tom Udall, D-N.M., is among five senators sponsoring the bill and provided testimony in front of the committee in Washington, D.C.
“This bill would close the gaps in the Radiation Exposure Compensation Act to make sure that those downwinders and miners and millers who were unknowingly exposed to radiation — but who are not now eligible under the act — are fairly compensated,” he said. Although Congress amended the act in 2000, it still left out several groups, including downwinders living in the Tularosa Basin in New Mexico and the post-1971 miners, Udall added. “While the federal government stopped purchasing domestic uranium in 1971, the mines continued to operate and the federal government failed to implement worker safety standards,” Udall said adding work sites lacked showers and caused workers to take contaminated clothing home. Approximately 30 million tons of uranium ore was removed from 1944 to 1986 from the Navajo reservation, and more than 500 abandoned uranium mines exist in the region, according to the U.S. Environmental Protection Agency. Navajo Nation Vice President Jonathan Nez provided comments to the committee on behalf of the tribe. His comments included calls to support amending the types of documentation used to prove residency and employment. “The verification process for downwinders is cumbersome and restrictive. The DOJ should allow the use of affidavits from local officials to verify residence,” Nez said. He added that information from uranium companies should be streamlined to ease the verification process. “As the Navajo Nation vice president, I urge you to act now. Our people have been waiting for justice for far too long,” Nez said. He noted that among those attending the hearing was a tribal member who developed health problems from uranium mining. This individual could not fly due to his health, so he drove across country to attend the hearing, Nez said. Adivasis (indigenous people) in a remote area of India, suffer health effects from the nuclear industry? with him all the time to look after him. He cannot be left unattended. lumbar scoliosis – a C-shpaed curve formation of her vertebral column. soles, he is unable to speak normally. infertility, miscarriages and pre-mature deliveries. in and around the uranium mining operational area. U.S. House Approves Measure to Compensate Arizona ‘Downwinders’ http://knau.org/post/us-house-approves-measure-compensate-arizona-downwinders, By RYAN HEINSIUS 31 May 18 • Many Southwesterners sickened by Cold War nuclear weapons testing were excluded from a 1990 federal compensation program. Now the U.S. House has approved a measure aimed at providing relief to the residents known as downwinders. KNAU’s Ryan Heinsius reports. The original Radiation Exposure Compensation Act left out parts of Mohave County, the Hualapai Reservation, and southern Nevada, despite high rates of cancer and other diseases thought to be caused by nuclear fallout. The new House amendment orders the National Cancer Institute and the Centers for Disease Control and Prevention, to assess whether thousands are eligible for assistance. “The American government made a promise with RECA, with the bill, and, by darn, we ought to follow through with it to make sure that anybody that was affected to be included in this process,” says Arizona Republican Paul Gosar who authored the measure. Residents who’ve developed some diseases could be eligible for a $50,000 payment, and have until July 9, 2022 to file claims. Nearly 200 atmospheric weapons were tested north of Las Vegas between 1945 and 1962. In the last three decades, more than 20,000 downwinder claims have been filed with the Justice Department, totaling more than $2 billion. EXTRACT from: A journey to the heart of the anti-nuclear resistance in Australia: Radioactive Exposure Tour 2018, NUCLEAR MONITOR Author: Ray Acheson ‒ NM859.4719, May 2018 “……The federal government of Australia wants to build a facility to store and dispose of radioactive waste in South Australia, either at Wallerberdina Station near Hawker or on farming land in Kimba. Wallerberdina Station is located in the Flinders Ranges, the largest mountain range in South Australia, 540 million years old. Approaching from the north on our drive down from Lake Eyre can only be described as breathtaking. The red dirt, the brown and green bush, and the ever-changing purples, blues, and reds of the mountains themselves are some of the most complex and stunning scenes one can likely see in the world. What is known is that the Wallerberdina site is of great cultural, historical, and spiritual significance to the Adnyamathanha people. It borders the Yappala Indigenous Protected Area, which is a crucial location for biodiversity in the Flinders Ranges. Its unique ecosystem provides a refuge for many native species of flora and fauna, contains many archaeological sites as well as the first registered Aboriginal Songline of its type in Australia, and is home to Pungka Pudanha, a natural spring and sacred woman’s site. In case that isn’t enough, the area is a known floodplain. Our travels around the proposed site contained ample evidence of previous floods that sent massive trees rushing down the plain, smashing into each other and into various bridges and other built objects. The last big flood occurred in 2006. We met Adnyamathanha Traditional Owners Vivianne and Regina McKenzie, and Tony Clark, at the proposed site. They invited us into the Yappala Indigenous Protected Area to view the floodplains and swim in the beautiful Pungka Pudanha. We’d just been camping at Wilpena Pound in the Flinders Ranges National Park only a few kilometres away. It is impossible to understand the government’s rationale for wanting to build a toxic waste dump on this land so cherished by its Traditional Owners, local communities, and tourists alike. The McKenzies have been working tirelessly to prevent the proposed dump from being established, as have other local activists. Fortunately, they have some serious recent successes to inspire them. In 2015, the federal government announced a plan to import 138,000 tonnes of high-level nuclear waste from around the world to South Australia as a commercial enterprise. But Traditional Owners began protesting immediately, arguing that the so-called consultations were not accessible and that misinformation was rife. In 2016, a Citizen’s Jury, established by then Premier Jay Weatherill and made up of 350 people, deliberated over evidence and information. In November that year, two-thirds of the Jury rejected “under any circumstances” the plan to import or store high-level waste.24 They cited lack of Aboriginal consent, unsubstantiated economic assumptions and projections, and lack of confidence in the governmental proposal’s validity. 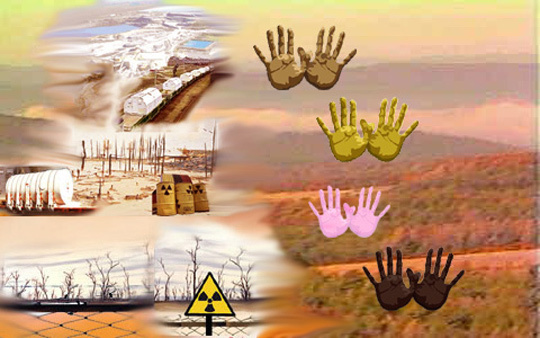 The attempts by the Australian government and the nuclear industry to impose a waste dump in the Flinders Ranges, just like their attempts to impose waste dumps and uranium mines elsewhere in the country, or their refusal to compensate victims and survivors of nuclear testing, are all mired with racism. 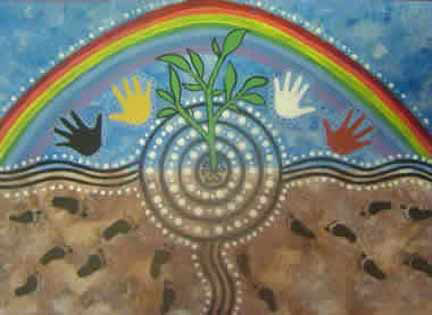 They are rooted in a fundamental dismissal and devaluation of the lives and experiences of indigenous Australians, and of proximity to cities but more importantly, to power.The industry and government’s motivations for imposing nuclear violence on these people and this land are militarism and capitalism. Profit over people. Weapons over wellbeing. Their capacity for compassion and duty of care has been constrained by chronic short-termism ‒ a total failure to protect future generations. The poison they pull out of the earth, process, sell, allow others to make bombs with, and bury back in the earth, wounds us all now and into the future. But nuclear weapons are now prohibited under international law. New actors are challenging the possession of nuclear weapons in new ways, and nucleararmed states are facing a challenge like never before. The nuclear energy industry ‒ and thus the demand for uranium ‒ is declining. Power plants are being shuttered; corporations are facing financial troubles. Dirty and dangerous, the nuclear industry is dying. This is in no small part due to the relentless resistance against it. This resistance was fierce throughout all of the country we visited, from Woomera up to Lake Eyre, from Roxby Downs to the Flinders Ranges. We listened to stories of those living on this land, we heard their histories, witnessed their actions, and supported their plans…..
“I’ve heard a lot of warm sentiments about how this part of the state knows about nuclear science, and how much you all welcome it,” she said. …. Morgan said the project was an example of “nuclear colonialism,” forcing low-income and minority-majority regions to unfairly bear the risk of storing nuclear waste. …….. Karen Hadden, executive director for the Sustainable Energy and Economic Development Coalition said even with monitoring, the risk of radiation exposure was too high to support the project. Why do we desperately need to listen to voices from the heart? The corporate dominated world does not like to hear voices from the heart. Oh no, there must be no emotion. We must all stick to technical jargon, statistics, the “accepted” facts, in appropriately respectable academic language. Of course statistics, facts, and technical language have their place in the nuclear-free movement. But as long as the anti-nuclear voices remain boring, the corporate global empires do not need to worry. Jan – Janotine@asia.com– 6 May 18 -My grandad was half kiowa. His father married a native american lady, to expand his spread. She was his last wife. The other two died in child-birth. All, so he could have more slave kids to work his spread. May grandad ran away from home at age 12. I am a westerner. I used to think the west was so grand! My family is from the west. Places like Utah, Arizona, Nevada, New Mexico, Washington, Oregon, Idaho, and yes parts of California. Later, i realized, our frikin government, used the west as a sacrifice zone for open air nuclear bomb testing, biological and chemical warfare testing, uranium mining and processing, nuclear bomb testing. I have been to every native nation in the west and, most in Alaska as a professional. No sane person thinks the anglos did the west any favors! People ask me if natives or, even anglos are better off from the europeans coming in and taking america. The anglos used their rascist-Monroe Doctrine, as an excuse for the environmental destruction and genocides of the once pristine, western United States! In the end, is the west better off? Hell no! They ruined turtle island, and the whole northern hemisphere with their insanity! Shockley was the dumnest, white rascist ever! He might have helped invent transisters, but the genetics of Europeans and Americans are forever ruined, by the white evil-war-monkey obession, with the magic rocks. There are very few radionuclide toxicologists in the world because, of the nuclear cosa nostra. Radionuclides are a billion times more genotoxic, teratogenic, mutagenic, carcinogenic, than the most dangerous manmade-mutagenic, chemicals, like agent orange. Anything factual about radionuclides is verboten! Environmental health professionals, are pariahs in the war-monging, capitalist-paradigm. Health physics is nuclearist propaganda. Superior Northern-European culture and technology, is a sick-cosmic-joke.